Imagine running out onto the same fields where Sammy Sosa learned to play baseball as a youth in Consuelo, Dominican Republic. ILI Baseball Training camps transport you to the playgrounds where some of Major League Baseball’s biggest stars honed their craft. From Sosa, Pedro Martinez and David Ortiz to the young, up-and-coming talents of today, you will experience the wonders of learning and training in a baseball hotbed. High school teams, AAU teams, and college teams from Montgomery County, PA, Union County, NJ, and anywhere in the United States can play baseball every day with Dominican players during this tour. This is a once-in-a-lifetime opportunity to bond as a team while building your cultural competency. Day Two: Breakfast at the hotel, tour the baseball academy, and play baseball. Then go to see the baseball Hall of Fame. This day can usually include playing baseball, if desired. Days Three-Six: Breakfast at the hotel, visiting local communities to learn about baseball, and playing baseball every day with locals. Day Seven: Beach island and snorkeling excursion, or white water rafting. Day Eight: Breakfast at the hotel, then return home. 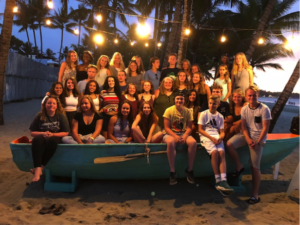 If your team wants to include volunteer opportunities at a local school on non-profit organization in the trip, we can plan that. We have an active history of running service learning programs in the Dominican Republic. For more details, visit Dominican Republic volunteer opportunities. Players will remember this trip better than any tournament in Bucks County or Burlington County because ILI provides the opportunity to cross borders and experience the deep love for baseball that unites children and coaches from different countries and cultures. While the Dominican Republic is far from homes in Montgomery County, PA, or Warren County, NJ, those differences tend to melt away while on the field. Our Baseball Training Camps in the Dominican Republic give baseball teams from Chester County, PA, Essex County, NJ, and beyond a chance to understand a different side of the Dominican Republic. You will forever see this country differently than those who just visit the thin strip of white sand beaches. And you will forever see baseball differently than the typical American fan. Whether you live in Bucks County, Chester County, Burlington County, or elsewhere, your view of our world will forever be changed, along with your relationship with teammates and the game of baseball itself. Airfare. Individuals are responsible for transportation to and from the airport and money spent inside the airport. Lodging. All lodging in the Dominican Republic is included. Meals. All meals, except for in airports, are included. Transportation within the country. Local transportation for the team in the Dominican Republic is included. Full-time, local Field Director stays with the group. Full-time, local bus driver who stays with the group. See below for details on safety. Safety is our top priority. We have a bilingual Dominican Field Director who stays with us the entire time. We also have a bus driver with us, as well. Eating with us and staying in the same hotel. In the event of an emergency, the driver and Field Director know the location of the closest hospitals and medical clinics. We hire a bus company that is highly regarded for its experience working with international groups and has a record of zero accidents. Chaperones travel for free. They will be in charge of recruiting and leading their group. ILI Travel will take care of the travel details. Contact us from any area in the United States. Right now, there are particularly good airfare rates – making the final price more affordable – coming from Bucks County, Chester County, Montgomery County, Burlington County, Essex County, Union County, Warren County, or neighboring locations. Participants will always remember our unique baseball trips. This opportunity to cross cultures and bond over baseball is something that children and coaches will talk about for many years to come.